Astronomers have learned that the center of our Milky Way galaxy harbors a long-sought black hole. But the finding has raised even more questions than before. Above: X-ray telescopes like the Chandra X-ray Observatory can detect the fiery glow from super-heated gas swirling into a black hole. Whatever could the discrepancy mean? Chandra X-Ray Observatory -- This all-around site includes material for the press, for educators, and astronomy enthusiasts. 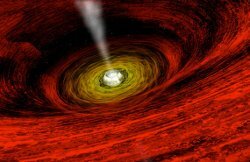 A Black Hole and a Supernova in the Galactic Center -- astronomers learn why x-rays from the vicinity of a supermassive black hole at the center of the Milky Way are so feeble. X-ray Astronomy Field Guide: Black Holes -- find out more about stellar, mid-range, and supermassive black holes. Black Hole Snacks -- (Science@NASA) NASA's Chandra X-ray Observatory has spotted a curious outburst from our galaxy's core -- a sign that the Milky Way's central black hole may be snacking on its neighbors. Galactic Center Flicker Indicates Black Hole -- (APOD) Why would the center of our Galaxy flicker? Find out here. 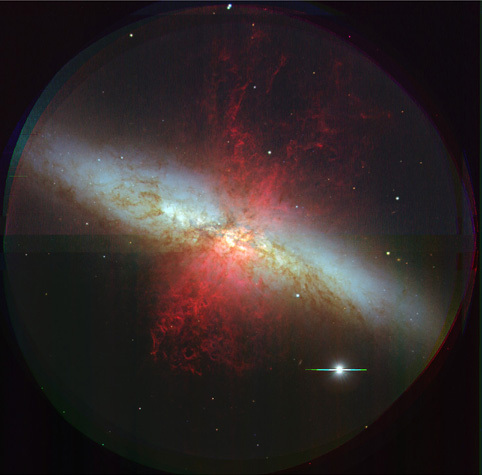 A Middle-Mass Black Hole -- (APOD) Chandra's image of a middle-weight black hole in galaxy M82.